The poems, some of them in prose, in this taut and stunning book, dart by like small desert animals. Billy is in charge here, all the way, speaking with the cool precision of an assassin, his images coming rapid and accurate as bullets, taking the measure of friends and enemies, hawks circling, horses straining, women loved and men murdered. Billy, loving Miss Angela Dickinson, who "leans back waving feet at me/catching me like a butterfly/in the shaved legs in her Tucson room"; Billy, appraising Mr. Pat Garrett, who "became frightened of flowers because they grew so slowly that he couldn't tell what they planned to do." 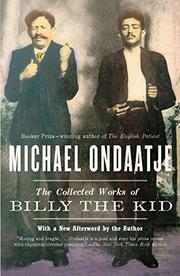 Billy, Mr. William Bonney to you, is in control but Ondaatje alternates his voice with that of others who knew him and the many sudden deaths and the dusty stillness of the Southwest, incorporating a jailhouse interview with the press, a passage from a 19th century children's book celebrating the fair Mexican ladies and their boy bandit king, eyewitness accounts and photographs. The effect is that of a series of sepia daguerrotypes of the Old West circa 1880. The cheap pop immortality of Billy is compressed and reduced into hard gemstone. Previously published to wide acclaim in Canada, this has the impact of a high-voltage wire.